The Duck Pond, with its calm water, beautiful bridges, stacked-stone walls and green peninsula, wasn’t originally part of Eretus Rivers and Frank Owens’ vision for Peachtree Heights East. Indeed, advertisements for subdivision in 1909 read "the trees are beautiful, the land is rolling and well drained, several flowing springs are found.” But there was no mention of a ‘pond’ or a park. It is a tranquil oasis just a block off of Peachtree Road. Generations of Buckhead residents have fished, played and picnicked in the small park, which serves not just the neighborhood, but all of Atlanta. It is open to the public, and maintained by the neighborhood, which spends more than $30,000 on its upkeep. This money comes from neighborhood association dues and the Friends of the Park. The neighborhood sits on land that once belonged to Leontine Chisholm Andrews, which was bounded by Lindbergh Drive. It was developed between 1908 and 1920 owing to a substantial break during World War I. By 1913 there were around 20 homes in the neighborhood. In the minutes of the Peachtree Heights Community Club in 1922, credit for the “lake” and beautification efforts is given to residents. After Rivers’ death in 1932, his widow, Una Rivers deeded the 7.35 acres encompassing the Duck Pond and surrounding park area to a trust to be held in perpetuity for the benefit of the residents of Peachtree Heights. The greenspace extends along Parkside Drive from nearly Peachtree Way all the way to Lindbergh Drive. The park underwent major restoration in 2001, when the Duck Pond was drained and dredged, new silt ponds, retaining walls and bridges were built and new landscaping was installed. 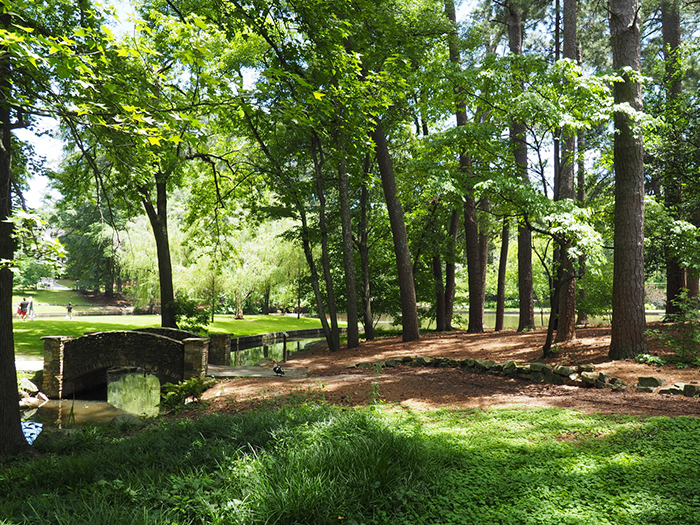 The urban lake serves an important role in the Atlanta eco-system, as its water ends up in Peachtree Creek. 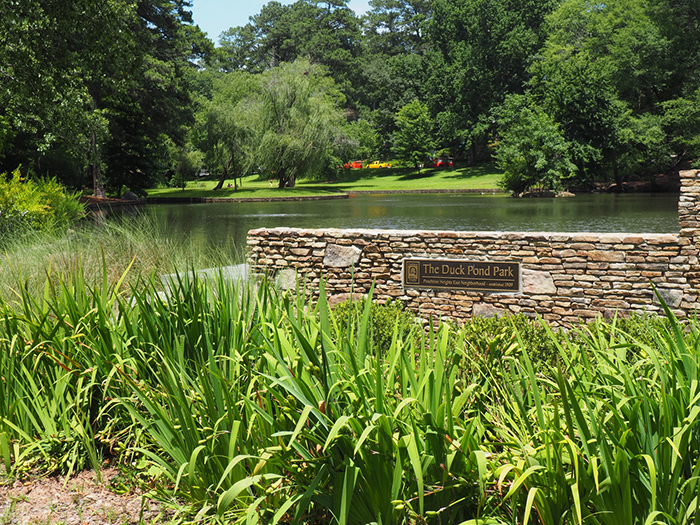 To learn more about the Duck Pond, visit the Peachtree Heights East neighborhood web site by clicking here.